Celebrate the beach and love the Sweet Life! 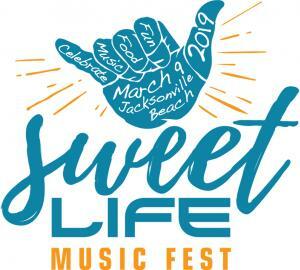 Join Jax Beach Festivals for our Sweet Life Music Fest in the VIP area for some of the best beach music to soothe, chill and enjoy life! We'll have displays, demos, foods and activities all geared toward the entire family. separate food and beverage area (where the musicians are available!) and more. Wristband Rules: These are rain or shine events; no refunds or replacements; not responsible for lost or stolen wristbands, altered or broken wristbands are not valid; wristbands must be worn at all times and all sales are final. Tickets must be redeemed for a wristband at Will Call with photo ID. No transfers, no proxies (no one can pick up your badge for you). VIP open seating only, no reserved seats, no saving seats, no strollers, no umbrellas, no coolers, no chairs, no children under 5. Purchase of ticket constitutes agreement with these rules. BANDS MAY NOT BE REMOVED AND WILL NOT BE REPLACED. THEY MUST BE WORN FOR THE ENTIRE DAY.